The acceleration in global economic growth that began in late 2016 looks increasingly sustainable. A marked improvement in economic activity is becoming apparent in regions that matter to U.S. manufacturing prospects, including East Asia, the Eurozone, and Canada. In spite of two devastating hurricanes, U.S. economic growth has accelerated in recent months. U.S. GDP growth has averaged 3.1% in the second and third quarters of 2017, up from a 2% average over the prior four quarters. 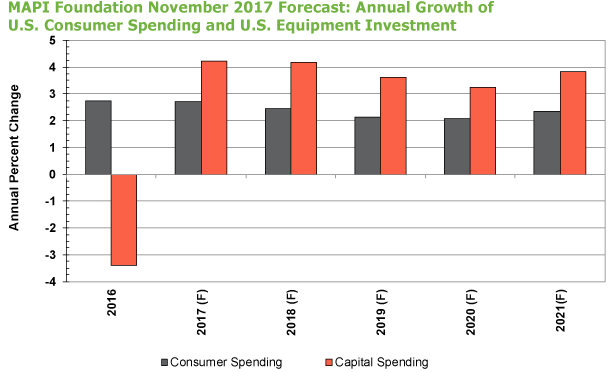 There has been a significant acceleration in the pace of business equipment spending growth since the early months of 2017, a potential sign of an increase in business confidence. In spite of a range of political instabilities, from the difficult process of negotiating the United Kingdom’s exit from the Eurozone to the independence movement in Catalonia, economic growth continues to improve in the Eurozone. Eurozone GDP growth has strengthened persistently since the third quarter of 2016 and has averaged a relatively strong 2.4% for the second and third quarters of 2017. The long-dormant Japanese economy appears to be enjoying a persistent and steady rebound. In the 11 months leading up to September 2017 manufacturing output has grown without interruption, a strong sign of a steadier domestic recovery and an improved export environment. The escalation of political and policy risk in Washington creates an ongoing uncertainty for the U.S. economic growth picture and by extension for the global growth picture. Nuclear tensions with North Korea and Iran could have dampening effects on global capital expenditure activity. Growing threats of protectionist policies in North America could have negative impacts on manufacturing on a global scale. The Federal Reserve is experiencing one of its most significant leadership transitions of modern times, and thus U.S. monetary policy is currently a risk for both the U.S. and global economies. President Trump nominated Jay Powell to succeed Janet Yellen as the new Fed Chair. While he has been on the Board, he remains an unknown quantity regarding his thinking on monetary policy. A new Vice-Chair will soon be named. William Dudley, the long-time President of the powerful New York Fed, will be stepping down. New Board members will soon be appointed. Collectively, all of this creates a high level of institutional turmoil at a time when difficult decisions are needed about balance sheet normalization and policy interest rate adjustments. With this report, we begin extending our forecast period to 2021. In our previous 2017 reports, the forecast period extended to 2020. In spite of these encouraging signs and uncertainties, the MAPI Foundation’s projection for U.S. economic growth remains almost unchanged from the June and September reports. Between 2017 and 2021, we expect annual U.S. GDP growth to be an average of 2.1%. Given that U.S. manufacturing performance is increasingly tied to the world economic picture that currently has a wide range of upside and downside risks, it has become the Foundation’s practice to simulate a number of global growth scenarios. Doing so allows us to explore the boundaries of possible factory sector growth in light of current conditions. Thus, in addition to a baseline scenario for U.S. manufacturing growth, this report offers both a pessimistic and an optimistic alternative. These suggest a range for average U.S. manufacturing growth through 2021 of between 1.2 % and 1.8 %. The MAPI Foundation’s current projection for growth in inflation-adjusted U.S. GDP, as well as growth in key components of GDP, remains moderate. The domestic economic picture has been buoyed by generally improving global economic conditions as well as the expectation that U.S. monetary and fiscal policies will remain growth friendly. On the flip side, U.S. growth is constrained by the uncertain path of sluggish productivity performance as well as demographically-induced labor supply challenges. We currently project that U.S. GDP growth will average 2.1% between 2017 and 2021, slightly slower than the 2.2% average for the 2017-2020 period we projected in our September report. The two primary drivers of growth, consumer spending and business equipment spending, are projected to be moderate by historical standards. Total consumer spending is forecasted to grow by an average of 2.3% over the 2017-2021 period, catalyzed by a projected 4.4% average growth in spending on durable goods. This is modestly slower than the 2.7% average growth projected in the September report, tempered by the persistence of slow wage growth and the expectation of slowing job growth. Business equipment spending growth is expected to average 3.8% over the forecast period, slightly better than the 3.6% average growth projection seen in the September report but weaker than the 4% growth projection offered in the June report. While business capital spending remains sensitive to changes in expectations for short-term GDP growth, historical norms suggest that equipment spending growth should be more than twice these rates. The slowdown in capital spending that has plagued the U.S. economy since about 2000 has been a negative for manufacturing performance, even as the factory sector has the opportunity to accommodate the growing demand for new production technologies in the current period of rapid process innovation. Even amidst a broad-based improvement in world economic performance, export demand remains sluggish. The fragility of the global recovery relative to previous world rebounds, as well as the still high dollar, are impinging upon global demand for U.S. goods and services. We currently project that total U.S. export growth will average 3.1% between 2017 and 2021, slightly better than the 2.9% average growth offered in the September report. Amidst global improvement, the dollar remains something of a wild card for the outlook. The modest depreciation seen throughout 2017 appears to have reached at least a temporary trough and will likely vacillate in a narrow range for a period as currency traders assess the U.S. outlook in the light of the recent strengthening of U.S. economic data as well as significant changes in the leadership at the U.S. Federal Reserve. 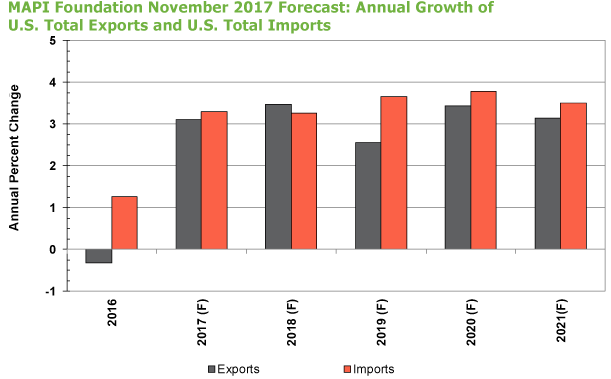 With the growth of import demand expected to be 3.5% over the forecast period, it is clear that trade pressures will remain an issue for the U.S. economy, and especially for the U.S. manufacturing sector, for some time to come even under the best case scenario for global growth and the dollar. Capital spending and export performance are the two key drivers of U.S. manufacturing prospects. With subdued outlooks for both variables, the factory sector forecast is improved from the stagnant 2013-2016 period but constrained by historical standards. We currently expect U.S. manufacturing growth to average 1.5% over the 2017-2021 period, slightly weaker than the 1.7% prediction in the September report and the 1.6% forecast from the June report. If the dollar were to resume its modest depreciation, the U.S. manufacturing forecast would certainly strengthen. The Foundation simulated two alternative scenarios on global growth, the primary driver of U.S. manufacturing strength over the short-term. The pessimistic scenario is meant to assess the drag from a range of risks in the world economic environment. Heightened nuclear tensions on the Korean peninsula and in the Middle East could ultimately slow global business investment activity. Political and policy uncertainties in the U.S. and the U.K. could, over the short-term, be a drag on U.S., U.K. and Eurozone economic performance. In this scenario, industrialized country growth is assumed to average 1.6% over the forecast period, versus 1.7% in the baseline simulation. Developing country growth is assumed to average 3.0% versus 3.2% in the baseline. U.S. manufacturing growth is projected to average 1.2% in this pessimistic scenario versus 1.5% in the baseline. The optimistic scenario reflects the possibility that global growth will accelerate beyond expectations as regional improvements reinforce each other. In this scenario, non-U.S. advanced country GDP growth is assumed to be 2% over the 2017-2021 forecast period versus 1.7% in the baseline, and developing country GDP growth is expected to average 3.4%, versus 3.2% in the baseline. U.S. manufacturing growth in this optimistic scenario is expected to be 1.8% over the forecast period, versus 1.5% in the baseline scenario. In spite of a range of political and geopolitical risks, the moderate but durable and widening world economic recovery is propelling a modest rebound in U.S. manufacturing growth after years of virtual stagnation. The dollar is a momentary wild card in the factory sector outlook. It has reached what appears to be at least a temporary trough after nearly a year of modest depreciation from an elevated level. Uncertainties surrounding the interpretation of recent stronger U.S. economic data and in assessing the changes in the leadership at the Federal Reserve will likely keep the greenback in a trading range for a period of time. Structural changes in the advanced economies that cap potential economic growth will weigh on the capacity for the further acceleration of global economic growth.